Their is extreme exaggeration in the belief of the ignorants regarding (the veneration of) their Spiritual mentors (Shaykh/pir). Even those with knowledge are not free from exaggeration, though they don’t consider their Shaykh to be equivalent to God but they have exaggeration in terms of unveiling (Kashf), for example they believe that when the Shaykh is attentive towards the hidden he can find out matters (which are hidden). May Allah Ta’ala save us from this deadly misguidance. The second manifestation and form of this exaggeration is in consulting the Shaykh in worldly matters. It took (me) a long time to understand this issue. 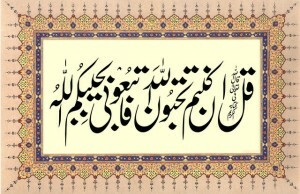 They believe that whatever the Shaykh says will surely bring success. Some make interpretation that whatever is uttered will have blessings (“Barakah”) in it. Whereas, blessing are (actually) in making supplications (Dua), so why don’t they suffice on (requesting for) Dua. Is this the true meaning of blessings? Failure can also be a form of it. This entry was posted in A. Reality of Tasawwuf, J. Rights , N. Advice, Q. Akabir, T. Tarbiyet on September 20, 2018 by 'abd. A question was put forward regarding the optimal duration of keeping company (suhba) of Shaikh. This entry was posted in A. Reality of Tasawwuf, J. Rights , N. Advice, T. Tarbiyet on August 30, 2018 by 'abd. Grand-Mufti of Pakistan Mufti Mohammed Rafi’s (Allah protect & preserve him) book “My Shaikh Hazrat ‘Aarfi” was being read. The passage was about when Arifbillah Dr Abdul Hayy ‘Aarfi (Allah have mercy on him) gave Ijaza of Baiyah to Mufti Rafi’, and he wrote a letter to Shaikh ‘Aarfi thereafter. The letter included how Mufti Rafi’ would feel dejected at his efforts for self-improvement but Shaikh ‘Aarfi’s letter granting Ijaza of Baiyah turned his low self-esteem into motivation to increase his efforts for self-improvement. This entry was posted in A. Reality of Tasawwuf, E. States, Q. Akabir, T. Tarbiyet on July 24, 2018 by 'abd. Companionship is a great thing. It comes in a Prophetic saying (Hadith) the gist of which is that sitting with a pious person is like sitting in the company of one who sells (the fragrance) Musk. One will smell the good fragrance just by sitting with him, even if one does not apply any perfume. And sitting in a bad company is like sitting with a blacksmith from whom either a spark will fly onto your clothes and burn them or at least you will have to smell the repugnant smell. This entry was posted in A. Reality of Tasawwuf, E. States, N. Advice, S. Sunna, Z. Mustahebbat on July 17, 2018 by 'abd. Sayyidi wa sanadi Shaikh Mufti Mohammed Taqi Usmani (Allah preserve & protect him) mentioned that his respected father Mufti Muhammad Shafee’ Usmani narrated that Hakim Ul Umma (Maulana Ashraf Ali Thanvi)(Allah have mercy on them) used to say that it is very difficult to become a (proper) human being. I could not become one but Allah showed us true human beings such that now (a beast like) a bull cannot deceive me saying that I am a human being. Respected Mufti Shafi added that Hakim al Umma used to say this about himself (i.e. that he could not become a true human being) due to his humility, whereas this statement actually applies to me. After looking at such people we understood how a human being should be like. If someone else comes and says that a human being should be something different, then Inshallah we would not be deceived. He also used to stay: “I have not read to many books. But I have observed men of Allah.” Like Shaikh (Rasheed Ahmed) Gangohi, Shayk al Hind, Hakim al UmmaThanvi, (Allah have mercy on them all). Meaning I stayed in their company for a long time. Their company created a certain temperament and way of thought. After observing their outstanding demeanor, Alhamdulillah the heart does not get attracted to others. Books give outwardly knowledge, but man is made by man, i.e. with his companionship. How to act on (and implement) on that knowledge is learnt from men. This entry was posted in A. Reality of Tasawwuf, B. Praise worthy morals, E. States, Q. Akabir, T. Tarbiyet on July 16, 2018 by 'abd.